Entry No. 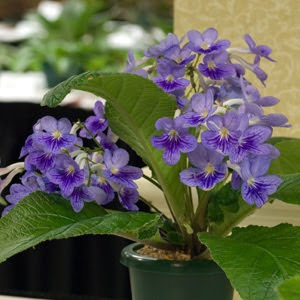 139, Streptocarpus 'Shy Blue', exhibited by Carol Hamelink. Score: 95. First Place. Entry No. 187, Streptocarpus 'Bethan', exhibited by Gail Gray. Score: 94. Second Place. Entry No. 338, Streptocarpus 'Butter Blues', exhibited by Sylvia Taub. Score: 89. Third Place. Entry No. 189, Streptocarpus 'Gwen', exhibited by Gail Gray. Score: 81. Entry No. 376, Streptocarpus 'Bristol's Jumping Jack', exhibited by Richard G. Carr. Score: 80.